Prom dresses were not always as fancy as they are now. Prom dresses, let alone designer prom dresses were almost unheard of in 1900s America (the beginning of the high school prom), where people would wear their Sunday best and would not dream of embarking down the route of prom dress hire. But then there was no need to hire prom dresses, as proms in those days were modest occasions where tea and polite socializing were the order of the day. 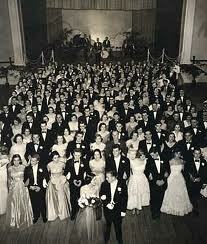 In the ’40s and ’50s proms became much more lavish, and girls turned to buying prom dresses or to prom dress hire. (Despite this, they still probably weren’t designer prom dresses.) High school proms became the coming-of-age event in high school students’ lives. With the advent of the 1980s, popular culture’s portrayal of the prom had allowed for the prom to acquire almost mythical status in terms of its importance. Achieving perfection in the form of their prom dress would make or break a girl’s life. Prom dress choices became even more fancy; more girls would opt to either hire prom dresses out of their price range, (or buy them if they were lucky enough to afford it), and some would even make their own. As in the rules layed out by ’90s movies, certain stereotypes would end up wearing a certain type of prom dress. Thus, the most popular girls at school, would don their designer prom dresses, while the ‘kooks’ and the ‘quirks’ would spend hours making their own. And then there’d be the those who were told by their less-well off parents they’d have to go for prom dress hire. ‘Prom’ didn’t come to Britain until much later. Although balls have been going on for centuries, the term ‘prom’ appeared in secondary schools in the 1990s. Prom dresses however, have long been a popular style of dress. Nowadays, when it comes to hire, prom dresses are in high demand, especially for Leavers’ Balls or Leavers’ Dos. Prom dress hire is not limited to school leavers, but designer prom dresses online at www.girlmeetsdress.com are hired out for all kinds of events, from weddings to black tie dos. Designer prom dresses online and prom dress hire online is a service growing in popularity. And how things have changed looking back on the history of the prom, dress hire and the changing attitudes toward it. Prom has come to mean multiple things, not just some cheesy high-school ending, just as prom dress hire is something that all people are doing these days. Prom dress hire is no longer just for proms but for all kinds of events, especially if people are looking to hire designer prom dresses. Take a look at our prom dress hire selection including designer prom dresses from Halston Heritage, such as this waist knot prom dress pictured. Posted April 12th, 2011 in Features, GMD Daily. Tagged: designer prom dress hire, prom dresses hire.